These two barred owls have a special foster dad this summer. The owlet in the front is utilizing his nictitating membranes. These help keep the eye clean & moist. It's not too often that a raptor can say that they have a full-time job, but here at REGI... nothing is out of the ordinary! These two baby barred owls (pictured above) were featured in an earlier blog eating some mice in the clinic. Since then, they have been placed with a foster dad. 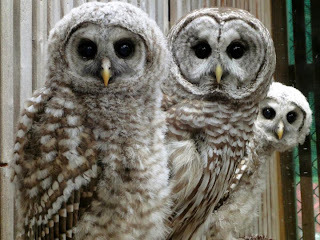 When he's not busy doing education programs for the public, this barred owl works a summer job as a foster dad (pictured below, in the middle). He cares for a handful of owlets every year, teaching them how to act like a raptor. With his help, baby barred owls that make their way into REGI don't become imprinted on humans. Imprinting occurs when humans have too much contact with younger birds. The babies view you as one of their own... their parent... their friend... their chef... their.... dare I say it... mate. Because of this, imprinted birds are non-releasable. They rely heavily on humans, and wouldn't be able to fend for themselves. Today, we celebrate our education barred owl's many accomplishments! Happy Foster Father's Day! Two years ago at this same time, our education barred owl was hard at work! New patients are filling up the clinic everyday, and not all of them are lucky enough to get foster parents. One of this week's new patients is a young bald eagle. 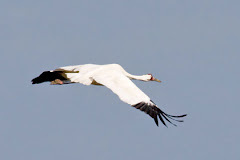 Although it's hard to believe, this bird hatched from an egg just this spring! Crazy! After only 10 weeks of being in the nest, young eagles are ready to make their first flights. Unfortunately, this one didn't have such a graceful first flight. Although the future looks bright for this young eagle, there is still a long road to a full recovery! Raptors aren't the only birds that come through REGI's doors. The majority of our babies this time of year are songbirds and ducks. These baby robins are enjoying their day outside! A family of Eastern phoebes taking naps after feeding. Can you guess who's still hungry? This baby turkey is only a day old. You can still see his egg tooth on the front of his beak. This tooth is used to help poke their way out of the egg. The crew eats a delicious meal! We are always hard at work and lunch time is no exception! This past Thursday, a delicious meal was prepared for the staff, interns, and volunteers from Linda, a long-time REGI friend! We made quick work of the chicken, mashed potatoes, corn, and COOKIES! Happy Father's Day! We were hard at work all day feeding babies from sun-up to sun-down! / ~ -...- ~ \     you?"